My daughter, who lives in L.A. and works in the film and TV industry, is connected like a made guy. She knows all the cool places to go, all the cool places to eat, all the cool places to stay without spending wads of cash. She’s a cool, sweet kid, more interested in unearthing cool stuff than in being cool, if you know what I mean. And the kid has taste not only in highbrow stuff, but in fine lowbrow stuff. Isabel: You should stay at the Best Western Hollywood Hills. Check it out! Isabel: It has this cool coffee shop. You’ll love! Okay, so the Best Western Hollywood Hills a short distance from Isabel’s apartment in Las Feliz it was. A Best Western, but a cool Best Western. It was $189 a night, not cheap, but not killer expensive. And I was eager to check out its insider secret: the throw-down, Seventies throw-back coffee shop. 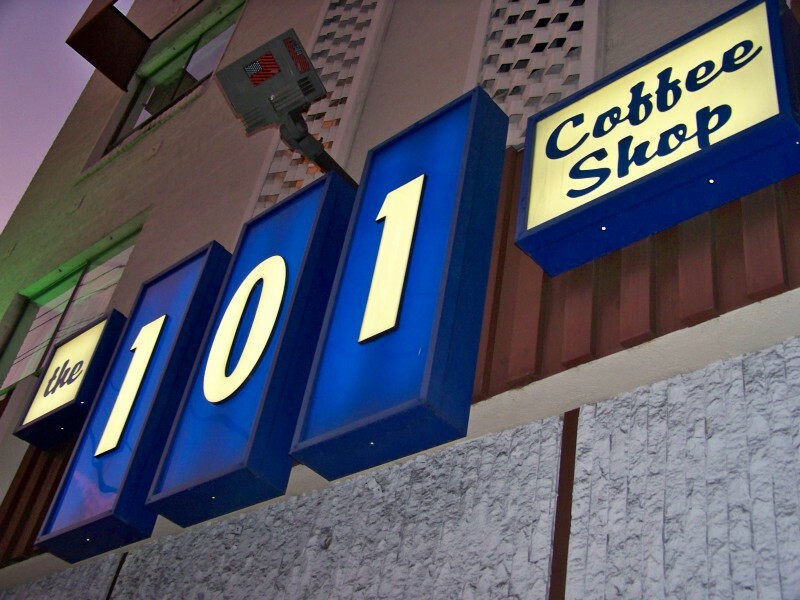 My first morning in L.A., I walked into the hotel’s 101 Coffee Shop like I was walking onto a movie set from my childhood: Shoney’s Big Boy on Brainerd Road in Chattanooga, circa 1971. I died. I mean I almost literally died. We only got to eat out on Friday nights when I was growing up, until my teen years when my dad made his fortune. But, oh, how my two brothers and I loved Shoney’s Big Boy. The spaghetti. And. The Hot Fudge Cake. Two pieces of chocolate cake sandwiching a slab of vanilla ice cream, topped with hot fudge, whipped cream, and a cherry — a perfect square of yum that I lived for. As Isabel and I slid into a leatherette booth in the 101 Coffee Shop, along the wall of groovy, Seventies school pictures, those memories washed over me like a tidal wave of happiness, like I was watching Saturday morning cartoons and eating Shoney’s Hot Fudge Cake all at once. “Tracee,” our waitress, an L.A. biker chick tattooed to die, was decked out in black jeans, tank, black leather vest, long pitch-black hair in spiraled braids, her movie-glam face done up with black eyeliner and blue eye shadow. And Tracee was sweet. She y’all’ed and darling’d us with that sweet Southern twang that’s music manna to my ears. I eagerly opened the menu she handed me like I was opening a hymnal at East Ridge Baptist Church and was about to sing praises to Jesus. Pancakes, waffles, French toast. Amen. Actually, I was so out of this world, I was about to speak in tongues. Hallelujah. I ordered the waffles with two scrambled eggs, wondering if it’d be as good as my momma’s homemade waffles for Sunday breakfast before church. Did it meet my expectations? Would I be writing about it if it didn’t? Go. Just go. We ate other great meals out, amazing meals, but I’m skipping over those to get to the good part. Breakfast. My favorite. For breakfast the next morning, Isabel had made a reservation for the Sunday jazz brunch at The Polo Lounge. She pulled us up to the front door of the Beverly Hills Hotel in her white Prius, hopped out, flipped some bucks to the valet. Valet parking in L.A. seems as run-of-the-mill operational to her as driving through Starbucks. Did I raise a solid middle class kid, or what? I thought. 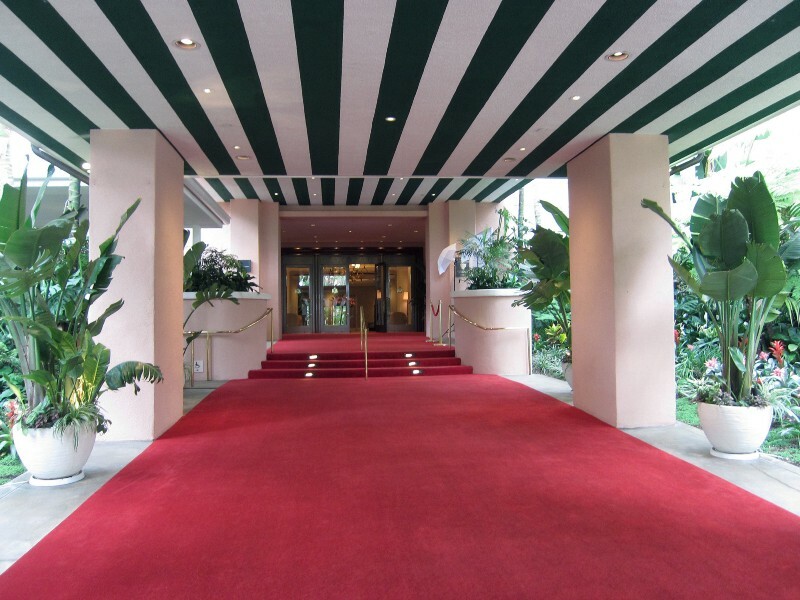 I followed Isabel through the legendary hotel’s lobby, looking for movie stars, trying not to stare. The kid gave her name at the hostess stand, and we strolled through the lounge proper — a dark palm-shaded room, murmuring with movie-secret conversations — in our best mother-daughter wear, like we were walking onto, as the song says — a yacht. Brunch is served in the Garden-of-Eden-style courtyard. 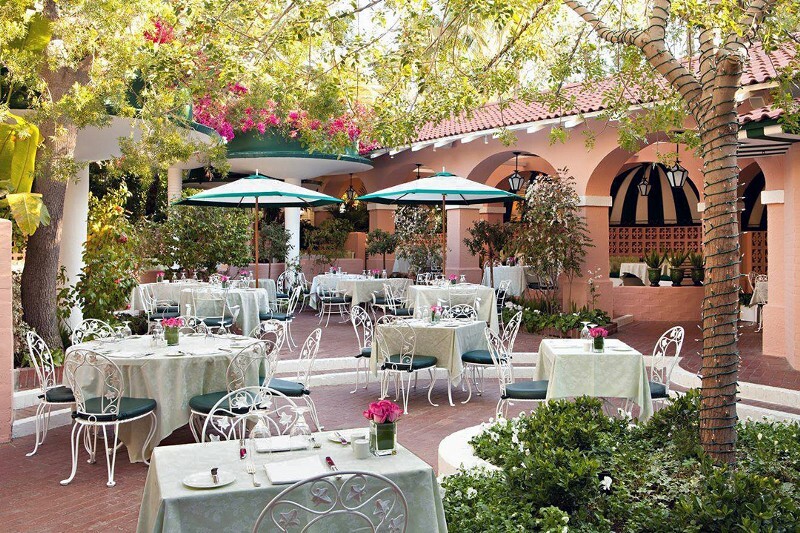 We were seated on the mezzanine, our table tucked into a palmed arbor overlooking the central patio. Behind us, on the outer circle of the mezzanine, in a booth, were the two thinnest, most glamorous, most laden-with-a-one-percenter’s-jewelry’d moms I’ve ever seen with a passel of three or four kids in tow under seven. I can only imagine. Pairs of folks dot the scene, taking meetings. Obviously. A crisp, friendly, middle-aged waitress in a starched, white jacket and black pants, out of 1940s central casting, passed us the menu. Classic Polo Lounge favorites are noted. I wanted those. We ordered the breadbasket to start, egg-white omelettes to compensate, mimosas to swill while we gabbed about the movies. We talked about how I’d always love, loved movies from childhood — from trips to the old-school Rodgers and Martin theaters in downtown Chattanooga to the spanking-new double screen at the East Gate Mall on Brainerd Road in the Seventies. I’d trained Isabel to be a movie buff from the time she could focus her eyes on a screen. I took her to the children’s film festival at the campus Cornell Cinema when she was in elementary school, rented foreign stuff on VHS at the video store: Majid Majidi’s films, Jean de Florette, Manon of the Spring. Watched everything Disney ever made. We talked about how much we missed picking out a film at the video store. I told her about the time when I was a freshman at Vanderbilt and met Robert Redford, who was at the student center taking a meeting about a film festival when Sundance was a glimmer in his eye. I told her how thrilled I’d been to spot Jacqueline Bisset — a star of Jaws, the blockbuster when I was in high school — shopping on the King’s Road in London the summer in college I worked in Chelsea. Ah, movie stars, the emblems of stuff that dreams are made of. Of course, it’s exciting to see them. I ate every bite on my plate, washed down with cup after cup of coffee the waitress poured me from a silver coffee pot. By the end of the brunch, I was in la-la land. “I’m sad,” I said to Isabel that night, the last night. I laughed and laughed. So did she. The kid is funny. She ought to work in pictures. My beloved aunt who’d lived her swinging twenties and thirties in L.A. has Alzheimer’s now. It could easily be me down the road. Guess I shouldn’t joke. But, my aunt was always telling funny stories, always laughing. Thankfully, she still does, even if she’s not quite the same, her essence still shines. Very early the next morning, packed up, we head out of the cool Best Western. A valet brought Isabel’s car around and loaded it for us. She tucked a few bucks in his outstretched hand. She’d been raving about it all weekend. It was right down the street. She pulled up to Kettle Glazed, its spring-green and orange-juice orange, hexagonal-tiled design L.A. cool. 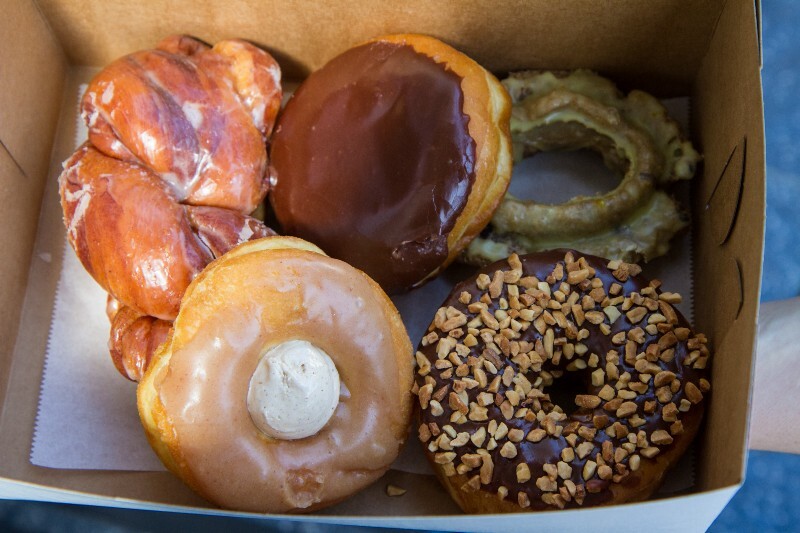 A young guy manned the shop like he was the hipster owner, sliding trays into the display case, clucking over an old dude at the counter studying his L.A. Times with a steaming cup of Joe and a tasty-looking-I want-that donut. Yum. Yum. Yum. Krispy Kreme Doughnuts. East Ridge, Tennessee. 1967. Here I come, I thought. We got coffees, a buttermilk maple, a plain croissant style. We got ’em to go. The breakfast treats steamed the car with joy. “How long will it take us to get to LAX?” I said. And it had been a perfect weekend in L.A.
Except…I had to leave, I thought, with tears in my eyes. New “Writing on the Edge” Posts Coming! Don’t Miss One! Sign Up! Please stick around and subscribe to my mailing list at the top of my page! I’ll discuss craft topics on writing, figure skating (my hobby with a passion), and/or life in each new “Writing on the Edge” post. This summer I’ll be starting an MFA program in the Sewanee School of Letters at the University of the South. I’ll post from there, too, and report on what goes on at a low-residency MFA program.